Opening on June 21, the summer solstice, the group exhibition Nothing of North Unknown at Galerie Alexandra Saheb in Berlin is dedicated to the northern landscape and the changes it is undergoing on a warming planet. Both arctic environments and picturesque "winter wonderlands" serve as the backdrop for confrontations with extreme environmental conditions, personal expressions of isolation, evocative dream-like scenarios or a sense of threat due to impending environmental change. While some works in the exhibition evoke the unique beauty of the North, others use fantastical images to suggest potentially apocalyptic events. On view at the height of summer, the exhibition explores a typically romantic topic from a contemporary standpoint: how current anxieties and desires are projected onto the landscape. Taken from a poem by the late U.S. poet Josephine Jacobsen, the title speaks to a growing consciousness about the global environmental change now taking place-and an the awareness for the diverse global communities who must come together to address impending ecological challenges. With Out of Harms Way Claire Healy and Sean Cordeiro (AUS) have created a new installation that summons recent images from the media of homes destroyed by of floods and other natural disasters. Personal belongings, what could be the contents of an entire living room, are turned upside down and braced against the ceiling with wood. There everything sits for safekeeping. The question remains how we are to live in this upside-down world. The Purple Cloud by Marie Jager (DK, USA) is a ten-minute video work that draws on a fictional scenario from a Victorian novel by the British author M. P. Shiel. In his story a volcano erupts in South East Asian and sends a poisonous gas into the atmosphere, which kills all living beings except for those who are able to make their way to Norway and the North Sea. Developed as a sequence of collages, the video uses the aesthetic of early film by combining text, still images and a soundtrack of contemporary music. In Amalia Pica's (ARG) Si no estás tú, a sequence of slides shows a boy tracing the outline of a palm tree in the snow with the help of a bucket. At the end he leaves the bucket behind, which is placed to look like a fallen coconut. While the work evokes a sense of childlike nostalgia for warmer climes, it also depicts coexistence in two places and the mental imposition of one climate onto another. 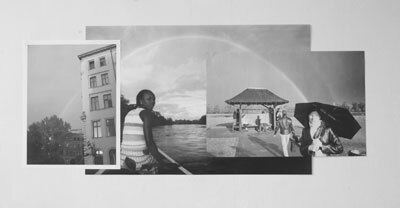 In addition, her Grayscale poster series draws on the ultimate symbol of impermanence and promise: the rainbow. With photographs taken in places ranging from Argentina to Suriname, different geographical locations become one in a unifying spectrum of gray tones, which create strikingly beautiful images that also seem to suggest the blandness of a world without difference. Vangelis Pliarides (GR) untitled painting is from an extensive body of work, in which figures interact on a polar landscape. Here, activities from the warmth of his native Greece are imposed on the ice. A building suggesting a monastery is situated on a glacial island and is somehow equipped with a bright green tennis court. Tiny figures bathe in the sea with the only illumination of the dark waters coming from a lighthouse. As the photograph mounted over the scene suggests, this arctic outpost serves as a site of emotional memory. Althea Thauberger's (CA) photographs are portraits of tree planters who work within the regenerative arm of the logging industry. These young people spend their summers in remote camps in northern Canada to perform the grueling physical work of planting saplings. Robust and glowing, clothed in work-gear with a hippie, alternative touch, individuals are depicted in the midst of a devastated landscape. Chris Watson's (UK) recording of the Icelandic glacier Vatnajökull is an orchestral masterpiece of natural sound beginning with the uncanny, deep creaking of the ice and culminating in the high-pitched cries of birds. Watson offers us a sonic portrait of a living landscape through tones that would normally be unavailable to the human ear-the sound of the glacier's slow, majestic flow into the Norwegian Sea. Claire Healy (*1971, Melbourne, AUS) and Sean Cordeiro (*1974, New South Wales, AUS) have been collaborating since 2003. The artists live and work in in Sydney and Berlin. They have been invited to represent Australia at the Venice Biennial 2009. Marie Jager (*1975, Copenhagen, DK) lives and works in Los Angeles. Amalia Pica (*1978 in Neuquén, ARG) lives and works in London. Vangelis Pliarides (*1964, Thessaloniki, GR) lives and works in Thessaloniki. Althea Thauberger (*1970, Saskatoon, USA) lives and works in Vancouver. She is participating in Manifesta 7. Chris Watson (*Sheffield, UK) lives and works in Newcastle Upon Tyne, UK. Laura Schleussner (*1969, New York, USA) lives and works in Berlin as an independent curator. She was a fellow in the De Appel Curatorial Training Program 2005-2006.